Why D.J.’s Custom Decking, Inc? Licensed, insured & bonded. Oregon CCB #57551. For more details regarding the wide variety of retail and wholesale products and services provided by D.J.’s Decking, please see the "Services and Products" page. Mahogany is a hardwood grown in warm climates. Instead of growth rings that leave wood weak (causing uneven wear and splitting), mahogany has interlocking fibers, which is conducive to strength and resilience. Mahogany is naturally resistant to decay and insects. Mahogany has been used extensively for exterior finish in the boat building industry. Compared to many other commonly used wood products, Mahogany is often less expensive. Our mahogany is sourced from countries that are leaders in ecological, sustained forestry practices. Mahogany accepts stain and paint evenly and easily and holds nails and screws tightly. 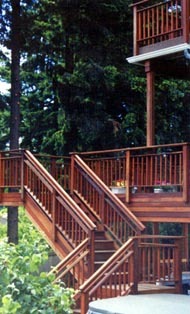 For examples of our mahogany decks, fences and outdoor structures, please visit our "Photos" page. Featured in Better Homes and Gardens, Fall 2001, "Garden, Deck, and Landscape - deck appreciation." Featured in Better Homes and Gardens, June 1991, "On The Board Walk."